All of us are lonely and unsure in friendships and relationships, but still friendships happen in their own weird, imperfect ways. Such is the tale of Lost and Found. A boy discovers a penguin and the penguin is sad. The boy wants to make the penguin happy, but no matter what he does the penguin is sad. The boy then decides that the penguin is homesick and they set out together on a perilous journey to get to the south pole. There, the boy leaves the penguin, but now both the penguin and the boy are sadder than they were before. Still the boy leaves the penguin, but regrets quickly and sails back to get the penguin – of course the penguin is long gone and the boy sets out for his home journey… only to find the penguin coming to get him. It was never sad, it was just lonely. 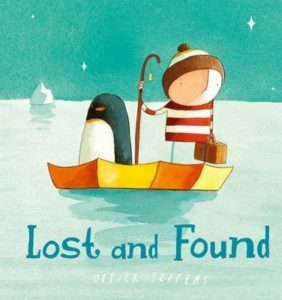 Oliver Jeffers is a master of finding the core of friendship and putting it on display without judgement or evaluation. His illustrations are beautiful and poignant. He never plays around with language, instead he strips it to its core and somehow it works by tapping into the darkness, the loneliness that kids seem to be so much closer to than adults. Jeffers never shies away from this darkness. His ending are never perfect or happy, but they are good, they are both light and darkness. Just like life. This sounds so sweet. Plus, penguin. I always recommend Oliver Jeffers. His art is so good.